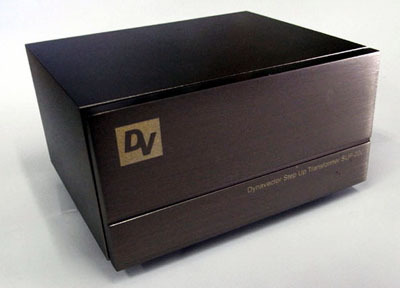 The Dynavector SUP-200 is superior quality step up transformer that will extract the very best musical performance from most moving coil cartridges. Although predominantly designed for use with Dynavector MC cartridges. The SUP-200 has 26dB gain and can be matched with all moving coil cartridges within the 3-35 ohms Impedance range and an output voltage of more than 0.1mV. The use of high permeability core material ensures ultra low distortion and maintains minimum power loss. The use of high permeability core material ensures ultra low distortion and maintains minimum power loss. Vibration control is achieved by impregnation of the coil. Further insulation is provided between the coil and casing. Large diameter OFC coil windings ensure minimal power loss, high resolution in the critical mid-low frequency area and a smooth high frequency response. The transformer is magnetically double shielded by a nu-metal housing then encapsulated in a thick aluminium case that completely separates the left & right channels and ensures complete shielding. A high quality carefully selected resistor is used to correctly terminate the secondary output to maintain a steady performance and excellent frequency response regardless of the change in load impedance or connected audio cables. 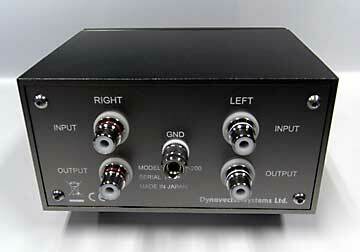 Rhodium plated input-output RCA terminals provide excellent reliability and long durability. Rigid construction of the aluminium chassis discourages vibration and culminates in a high performance aesthetically pleasing product.